Abruzo Vallelarga Di Pettorano to Mt Genzana! The cyclist mounts at a parking area which has a fountain. 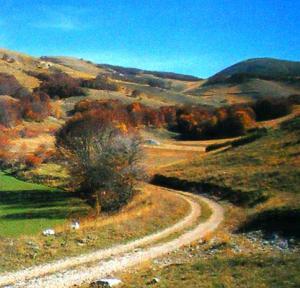 The area is located a short distance before Pettorano sul Gizio, te the right side coming from Sulmona along the Na- tional Floute that goes in the direction Hoccaraso; the park- ing area is about 5 km eut of Sulmona itself, From here, which is the starting point, the route goes right in the same direc- tion as indicated by the signs for lntrodacqua Scalo, Valle- Iarga and Scanno, crosses the bridge over the River Gizio and over the railway underpass and turns onto the paved road that climbs left. After pass- ing a group of houses, the cyclist begins a steep climb up a dirt road with an uneven sur- face. This soon enters dense woods. The altitude 5 km from the starting point is already 1,000 m. A few short stretches over level terrain is a way, and the only way, by which the biker can recover some breath. Exiting the woods l? km, altitude 1,1BD ml the cyclist comes across the first ofthe springs. The road re-enters the woods for a more demanding stretch lasting one and a quarter miles. At the 9 km mark counting from the start, the route exits the woods again near an animal enclosure which is found on the left at a locality called Le Crescenze (altitude1,380 rn}. The ride is at the halfway point with the most testing up- hill parts now over. At just before completion ofthe ride’s tlth km (altitude 1,580 ml there is a spot ideal for a moment of respite near Fonte dell'Acero Spring. The view from here is glorious, extending over magnificent expenses of forest as far as maiestic Mt. Amaro, The cycling is uphill once more and then over flat ground; after this the route comes to ari- other spring. ln gradual stages the cyclist reaches a hairpin bend (18 km, altitude i,800 ml which precedes a plateau and which is the highest point on the route (18.3 km, alti- tude 1,810 ml. Once having reached the plateau the cyclist assesses his re- serves of energy and chooses either to start back, in this case taking the first turning to the right and following the dirt road that goes to Fratttira and on from there to Scanno which is 33 km from Sulmona, or otherwise chooses to go on in the straight, downhill direction toward Toppe cli Vurgo as far as a fork in the road near a road barrier. Takrng the way left at this fork brings the biker down to Cinquemiglia Plateau below to a spot near a small church, while taking the fork that goes right carries the cyclist on, first over lev- el terrain and then downhill, to the spectacular Chiarano Gorge. From here, too, the route continues back down to Cinquemiglia Plateau. The cyclist reaches the National Route that goes to Floccaraso but in view ofthe dangerous traffic turns down the so-called "Napoleonica a lesser road that goes to Fioccapia, and cycles back to Pettorano this way.